Raymond "Ray" Schmechel, age 84, passed away Monday, August 20, 2018 and his beloved wife, Marlene M. (Davis) Schmechel, age 82, passed away Wednesday, August 22, 2018, surrounded by their loving family. Ray was born September 29,1933 in Green Bay, son of the late Clarence and Irene (Verheyen) Schmechel and was a graduate of East De Pere High School. Marlene was born March 23, 1936 in Green Bay, WI, daughter of the late Bernard and Stella (Verheyden) Davis and was a graduate of Green Bay East High School. After graduating from high school, Ray enlisted in the US Army and proudly served his country during the Korean War until his honorable discharge in 1956. Shortly after Ray's discharge from the Army, he met and married the love of his life, Marlene Davis. 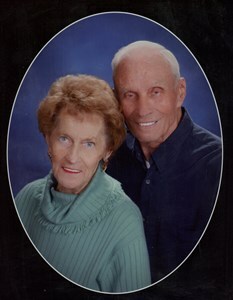 They shared 61 amazing years as husband and wife and were blessed with 6 children. Marlene was a licensed beautician and worked as a hairdresser until she started her most important job-raising her children. Ray retired from Fort Howard Paper Company after 35 years as a millwright. Once Ray retired from Fort Howard, the couple began snow-birding in Florida, which allowed them to spend equal time with their children in Wisconsin and Florida. Ray was an avid outdoorsman and enjoyed hunting, fishing and golfing. Marlene was very creative and loved to paint, garden and bake. They both shared a love for the Green Bay Packers. Their family was their pride and joy. Ray and Marlene are survived by their children: Daniel (Susan) Schmechel, Bonita (Michael) Wiesner, Julie (Wayne) Remondini, Linda (Daryl) Kinkeade, David (Cheryl) Schmechel and Robert Schmechel; 12 grandchildren: Reed and Madeline and step-daughters, Amanda and Robyn, Donald, Calvin and Nichole, Rachael and Ryan, David Jr., Samantha and Troy; 13 great-grandchildren (and 2 on the way!! ); Ray's siblings: Beverly (Lloyd) Kolb, Gene (Nancy), Roger (Merideth) and Jeffrey (Paula) Schmechel; Ray's sister-in-law, Pat Schmechel and Marlene's sister, Betty (Tom) VanLieshout. They were preceded in death by Ray's brother, Robert Schmechel and Marlene's brother, Thomas (Loyal) Davis. Visitation will be held at Newcomer-Green Bay Chapel (340 S. Monroe Ave., Green Bay), Tuesday, August 28, 2018 from 5 to 7 PM. A prayer service will conclude the visitation at 7 PM. Visitation will continue at St. Martin of Tours Parish (407 S. Warrington Ave., Cecil, WI), Wednesday, August 29, 2018 from 10 to 11 AM. A funeral service will follow at 11 AM. Ray and Marlene's family would like to extend their gratitude to the staff at Rennes, De Pere, as well as the Unity Hospice staff for their excellent care and support. Add your memories to the guest book of Raymond & Marlene Schmechel. To Bonnie and Dan and the rest of the Schmechel family: I am very sorry to hear about the loss of your parents and hope you are finding some comfort in remembering good times and events and remembering the love which really never goes away. My thoughts are with you and I will say a prayer for you. I am so sorry for your loss. If I would have known sooner I would have attended the funeral. I always wanted to see all of you again as it has been so long. Lots of memories were created growing up next door to all of you. Mother has asked time and time again if I ever see any of you. She is in the Cottonwood assisted living Green Bay (86 years old). I live Up at Kelly Lake and dont get the Press Gazette but occasionally look at the obituaries on line once and a while and was stunned when I seen both your Mom and Dads in there.Like I said my deepest sympathies go out to all of you. Ray and I have your family in our prayers tonight. I met your mother in 1954 when we attended beauty school together. We have been friends ever since. Ray was from DePere and went to grade school with your father. When they moved near us on Bay Shore Rd we became close friends again and missed them when they moved. We have many happy memories of our time together. You were blessed with wonderful parents. I’m so sorry for your loss Dan,Bonnie,Julie,Linda,David& Bobbie???? I will keep you in my prayers! ???? So sorry about the loss of your parents/Uncle Ray and Aunt Marlene. In this time of grief, you are in our thoughts and in our prayers. Your parents always had the natural ability to make everyone smile and laugh. I have very fond memories of the Christmas gatherings at grandmas and family times at the cottages up north growing up. Recently, I was able to chat with Uncle Ray at Uncle Jeff and Aunt Paula's house. So happy I was able to see him in good spirits having a great time with family. Such a special day for everyone. thoughts, hearts, and prayers! God Bless! My sincere condolences go out to you, Linda, your family, and the friends of your family. May you find peace, comfort, and love with each other in your time of grief. Let the sweet memories of your beloved parents bond your family together and give you strength in each other's presence. Sending a gentle stream of love and light to comfort you. I couldn't have asked for better in-laws! You both will be in my heart forever. Your love for each other and for your family was limitless. Ray and Marlene, rest in peace together. We are truly sorry for your loss. What you are going through right now is very difficult, just know that we are here for you. Your parents have left a legacy of wonderful memories and love that will remain in our hearts forever. Sending love, hugs, and prayers!